Company of Heroes 2 (COH2) is a real-time strategy video game developed by Relic Entertainment and published by Sega on 2013 as the sequel to the Company of Heroes (COH) which was published on 2006. Company of Heroes 2 is available for Microsoft Windows, macOS (Mac OS X), and Linux. Similar to original game, the game play Company of Heroes 2 is set in World War II, but focuses on the Eastern Front instead. The players controls the side of the Soviet Red Army during various stages of the Eastern Front, from Operation Barbarossa to the Battle of Berlin. Humble Bundle is giving away Company of Heroes 2 for a limited time, or more specifically until 11am, December 16th 2017 PDT. To redeem the free game, you must have both Humble Bundle and Steam (where the game is delivered) account, and link those account together. 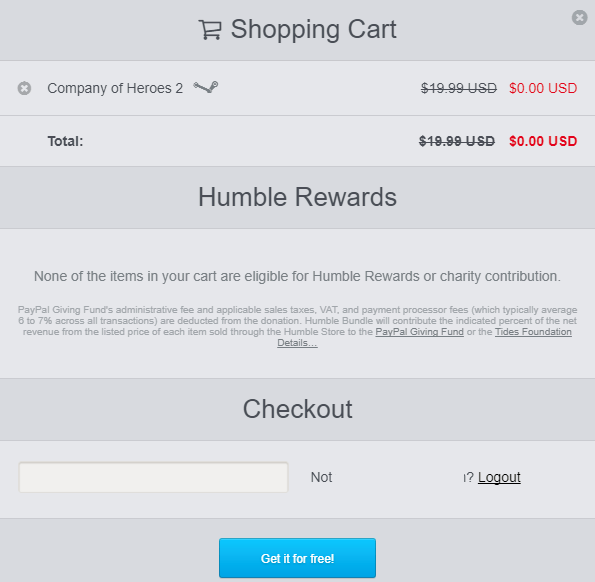 Login or sign up for Humble Bundle account. If you haven’t linked Humble Bundle to your Steam account, do so when prompted. Alternatively, you can go to Account Settings -> Steam Link to sign up to Humble Bundle with Steam account for account linkage. Click or tap on “FREE!” (“ADD TO CART” when hover) button. Click or tap on the Get it for free! button. 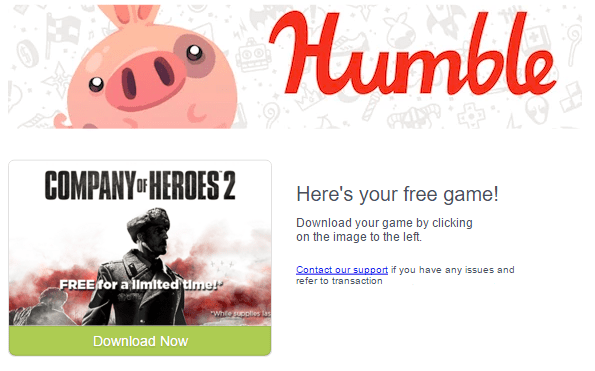 Once checked out, Humble Bundle will send an email with link to claim the Steam key. Or you can simply click or tap on “Preview Email”. Click on the link on photo of Company of Heroes 2 with “Download Now” wording. Hit Reveal your Steam key. Hit Redeem button to open the “Activate a Product on Steam” web page to redeem the Company of Heroes 2 free game on Steam platform. Alternatively, you can redeem the game manually via https://store.steampowered.com/account/registerkey on Steam client (Games -> Activate a Product on Steam) with the Steam key revealed. Follow the wizard to enter the key as product code to add Company of Heroes 2 to you Steam game library. You must redeem the Company of Heroes 2 on Steam before December 30th, 2017 at 10:00 am Pacific, and the Steam key will cease to work after the redemption deadline. Once Company of Heroes 2 is added to your game library, it belongs to you permanently. To play the game, you need to download and install Steam desktop client, and then install the game from it.